SEVEN INMATES HAVE been killed and 17 others injured in a riot at a maximum security prison in South Carolina, one of the deadliest in decades in the United States, authorities have said. 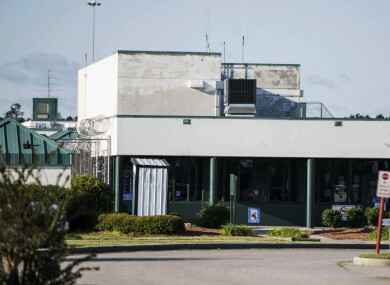 Fights among inmates erupted yesterday evening at the Lee Correctional Institution in Bishopville, South Carolina and were brought under control at 2.55am (7.55am Irish time) this morning. “The incident at Lee CI resulted in 17 inmates requiring outside medical attention and seven inmates were killed,” the department said on its Twitter account. All prison guards and law enforcement authorities who responded were “safe and accounted for,” it said. The department had initially described the riot as an “ongoing incident,” only revealing the scope of the problem hours after its start at 7.15pm (12.15am Irish time) yesterday. “The incident involved multiple inmate on inmate altercations in three housing units,” the department said. Lee Correctional Institution, which is reported to have the capacity to hold nearly 1,800 inmates, is a maximum security facility built in 1993 to house violent offenders and inmates who exhibit behavioural problems. In 1993, nine inmates and a corrections officer were killed in the Southern Ohio Correctional Facility, a maximum-security prison in Lucasville, Ohio. Probably the most famous was the 1971 rebellion at New York’s Attica prison. Email “7 killed and 17 injured in South Carolina prison riot”. Feedback on “7 killed and 17 injured in South Carolina prison riot”.